Satisfaction with your website is crucial and the only way for you to be completely satisfied is to give your developer good, reasonable and constructive feedback. Giving feedback and critique can be difficult for most people and some have a hard time knowing what to say. People giving critique usually fall on both sides of the spectrum. On one side of the spectrum are people who don’t want to give any negative feedback. Remember in school when you had to peer review each other’s papers and how hard that was — especially with your friends. I would just write “Good job!” and then tell them there was nothing wrong. I learned later on that doing that was hurting myself and the other person as well. When giving feedback to your web developer, you need to give them something constructive. Be specific about what you think and have an open conversation. Your opinion is very valued and wanted. Make sure you have a voice in the conversation. However, you do want to be careful about going too far to the other side of the spectrum. The other side is being too vocal and critical in ways that aren’t helpful. Positive feedback is just as useful as negative feedback. Being too negative about the work can put your developer in “defense mode” where they feel like they need to defend their work. This can break down the conversation and lead to nowhere. This doesn’t always happen, but it is more productive if you have a good mix of positive and negative feedback. Another thing you need to be aware of is critiquing things that you aren’t an expert on. Remember that you have hired an expert for a reason and they are the ones that know that area of expertise. Make sure you are respecting their knowledge and their valuable skills. 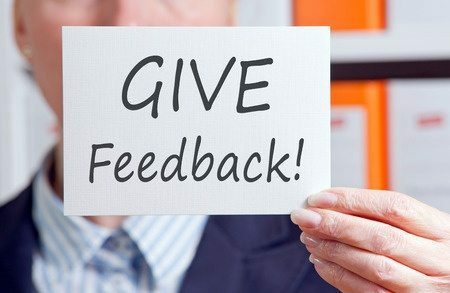 Giving good feedback is going to be very beneficial to you in the end. It will help you have the high-quality product that you want. Don’t settle for something less than you expected, but always be respectful of what they have created!